Engadget giveaway: Win a pair of Sonos One speakers courtesy of TurboTax! There's also a free TurboTax Live gift card on offer. It's that time of year again: Tax season! But don't fret, with all the intelligent services being offered now, there's less to worry about than ever. The Intuit TurboTax app and web interface let you complete your taxes without even leaving the house -- but you can if you use the mobile app and can even finish later on your PC. The household name in e-filing services has also launched its TurboTax Live feature this year. Now you can get virtual assistance from a network of certified tax preparers, just in case you hit a snag or really want to get the most out of your refund. There's even an Alexa Skill to check the status of your refund. So this week, TurboTax has provided us with a set of Sonos One smart speakers so you can keep track of that money just by asking. Plus, there's a gift card for TurboTax Live support which can give you some assistance maximizing your refund while minimizing any potential issues. All you need to do is head to the Rafflecopter widget below for up to three chances at winning this speaker and tax preparation combo -- along with some peace of mind! Winner: Congratulations to Michael M. of Fort Collins, CO! Winners will be chosen randomly. 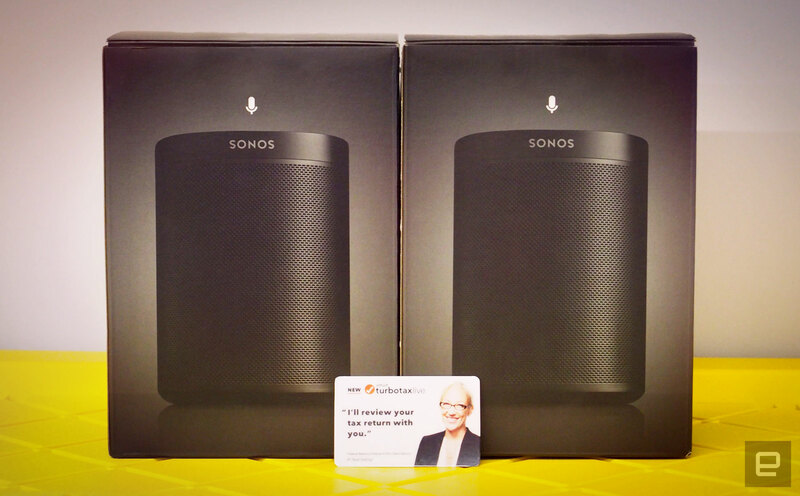 One (1) winner will receive two (2) Sonos One speakers ($350 value) and a TurboTax Live card ($179 value). Entries can be submitted until March 7th at 11:59PM ET. Good luck!